Formulated using traditional Chinese herbs, Heritage® Cough Alievaid Herbal Linctus is an all-natural, sugar-free and alcohol-free remedy to relieve cough and its associated symptoms. Our special formula is comprised of a blend of herbs working synergistically to alleviate cough and fortify the body's defense mechanisms. Loquat, Grosvenor Momordica, Platycodon, Hogfennel, Bitter Apricot, Pomelo Peel,Pinellia,Tendrilleaf, Liquorice, Peppermint, Menthol, Perilla, Baikal Skullcap. - Adults & Children > 12 years: 10-15 ml. 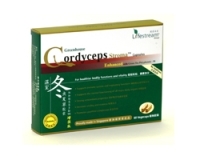 - Children 6-12 years: 10 ml. - Children 2-6 years: 5 ml. The recommended dosage may be consumed 3 to 4 times a day. Shake well before use. 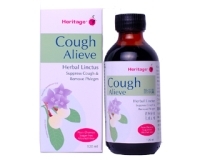 Heritage Cough Alieve is manufactured in Singapore according to stringent cGMP protocol and, is registered and approved by Health Sciences Authority, Singapore.